Snell, 25, joins David Price as the only other Rays pitcher to win the award. 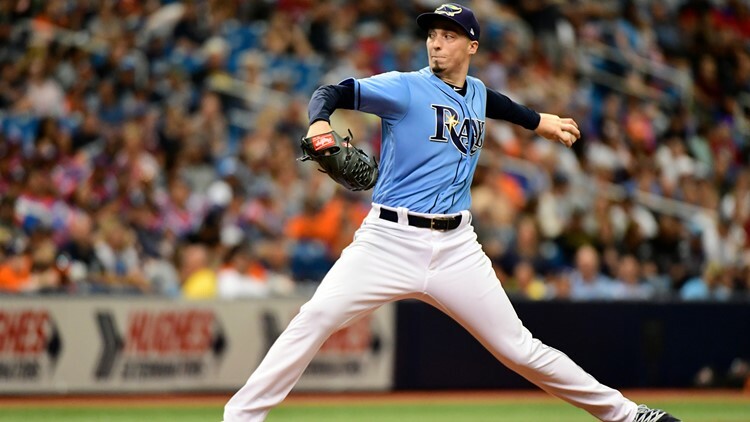 Major League Baseball named Tampa Bay Rays pitcher Blake Snell the winner of the 2018 American League Cy Young Award on Wednesday. Snell, 25, joins David Price as the only other Rays pitcher to win the award. The two are also the only two players in Rays’ franchise history to win 20 games in a season. Snell got 17 of the 30 first-place votes from the Baseball Writers Association of America. He received 169 total points, edging out Houston Astros pitcher Justin Verlander who received 13 first-place votes and 154 total points to win the Cy Young. This season Snell went 21-5 in 180.2 innings pitched with 221 strikeouts. Snell’s 21 wins were the best in baseball, and he led the AL with a 1.89 ERA. New York Mets pitcher Jacob deGrom won the 2018 National League Cy Young Award. DeGrom was a near-unanimous selection with 29 of the 30 first-place votes from the Baseball Writers of America. He also led the majors with a 1.70 ERA. Both Snell and deGrom are first-time Cy Young winners. The Cy Young Award is voted upon by the Baseball Writers' Association of America prior to the start of the postseason. From 1956 to 1966, the award was given to one pitcher, but has been given to one pitcher per league since 1967. The vote totals are based on a weighted points system.